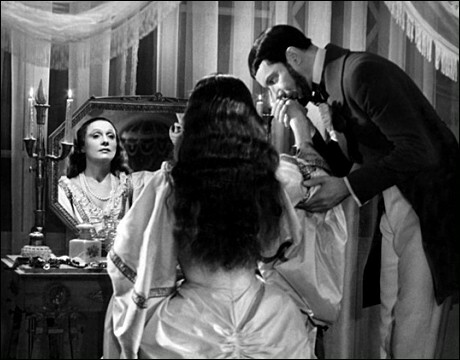 Maria Casarès in Les Enfants du Paradis. Photo: courtesy Pathé/Cinémathèque Française. Every French cinema fan can tell you: it’s the greatest Paris love story ever filmed. In every way, Les Enfants du Paradis (The Children of Paradise) is a legend, which is why the Cinémathèque Française is now giving it a special exhibition. They have assembled hundreds of photos, costumes, clips, posters, letters, scripts, scores—even one full-size replica of a set. But there’s no point urging you to see the exposition until you have seen, or reseen, the film itself. Once you’ve been spellbound by its timeless drama, you’ll make straight for the Cinémathèque. There, you can discover this classic was filmed in 1943, shot in Paris and Nice while the Nazis occupied France. The circumstances of its creation are so singular that Les Enfants holds a special place in film history and the United Nations has named it a World Heritage treasure. In 1996, French actors, critics, directors and technicians declared it hands down the best movie ever made here—ever. 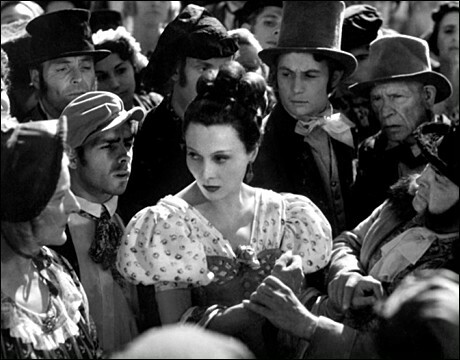 Arletty in the film Les Enfants du Paradis. Photo: courtesy Pathé/Cinémathèque Française. Its story revolves around four men in love with one woman. She is Garance, an enigmatic beauty from a humble background. The film’s author, Jacques Prévert, a much-loved poet, always described her as the ultimate Parisienne. (“This woman is a pure product of the Parisian pavements, proud, beautiful, impudent, worldly and independent.”) The French superstar Arletty, then 46 years old, plays her. In the whole of French cinema, there is no heroine more revered or considered more romantic. Many things would seem to make the story a less-than-likely classic. For one thing, it is a costume drama set in 1828. It is set among working-class theatre folk and takes place largely on the “Boulevard of Crime.” (Today this is the rue du Temple; then, it was chockablock with theatres offering melodrama.) Its “children of paradise” are the poor, who can afford only cheap balcony seats. There is no single hero, either, since the four suitors are very different: one a shy mime, one an ambitious actor, one a murderer and the last an aristocrat. To top it all off, the film was shot in black-and-white—and its running time tops three hours. Yet this Paris love story has changed lives for many reasons. 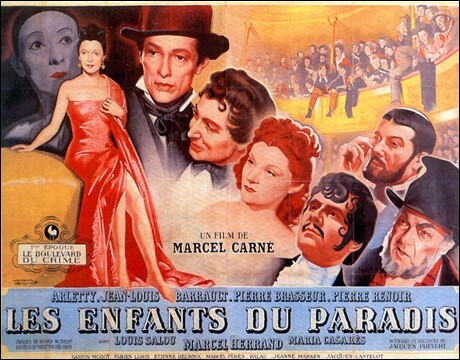 To make it, legendary director Marcel Carné managed to unite the finest talents of his era. 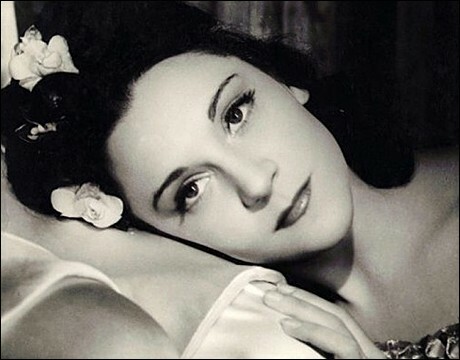 They included the set designer Alexandre Trauner and composer Joseph Kosma, not to mention actors Arletty, Maria Casarès, the romantic Jean-Louis Barrault and the popular, witty Pierre Brasseur. Pierre Renoir, son of the famous Impressionist, also plays a role. 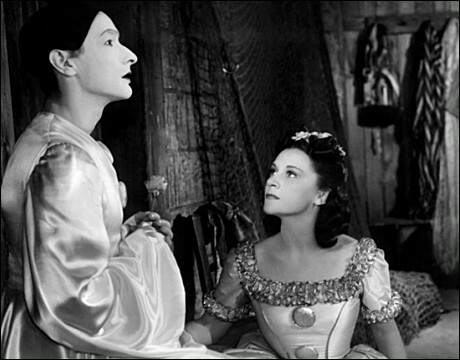 Jean-Louis Barrault and Maria Casarès in Les Enfants du Paradis. Photo: courtesy Pathé/Cinémathèque Française. The film deliberately set out to celebrate French values from friendship and loyalty to, of course, all kinds of love. There’s plenty of history, too. Each of the central characters is based on a real Parisian and the film’s plot includes true crimes. Often compared by French critics to a novel by Balzac, the movie is filled with plot twists and surprises. This is one of the benefits of its unusual length since, as events progress, we find no one is what they seem. As the exhibition shows, this was also true on the set. The movie takes place in a Paris of lavish dresses, grandiose theatre sets and overcrowded street scenes. However, this was far from the truth. The extras (some collaborators planted by German authorities) were eternally hungry and often stole food meant as props. The film’s composer and set designer, who were both Jewish, had to work on the project in secret for each lived in hiding. The leading lady, just like Coco Chanel, had a German lover. 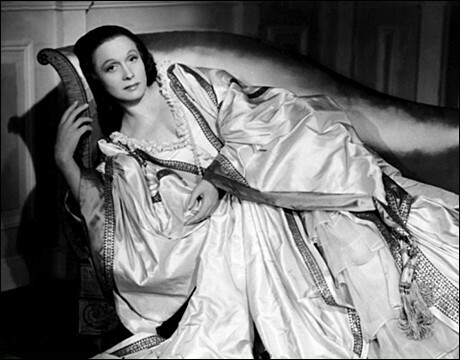 Arletty in Les Enfants du Paradis. Photo: courtesy Pathé/Cinémathèque Française. All these complications seem to have fed the movie’s greatness. For it turned out to concern life’s biggest questions. Its ending scene is justifiably one of the most famous in cinema. You just have to see it; then you’ll agree. Everyone has a Paris love story they especially prize and, for most Parisians, this one is it. If you’ve already seen The Children of Paradise, see it again. Although it has been shown around the world, all prints in existence were enormously degraded. However, the digital restoration finished in 2011 by Eclair Laboratories is one of the most complete and elaborate ever. The digital prints currently showing in Paris were made from the actual film shot in 1943; this classic would not have looked better at its very first showing. Editor’s note: Have you checked out our new GG2P video? If you like it, post it to your Facebook page or forward it to your friends.